Today I’d like to share a short 10min video on how I edit landscape photos in Adobe Lightroom and a little bit about the story behind this rather special shot I chose to edit. 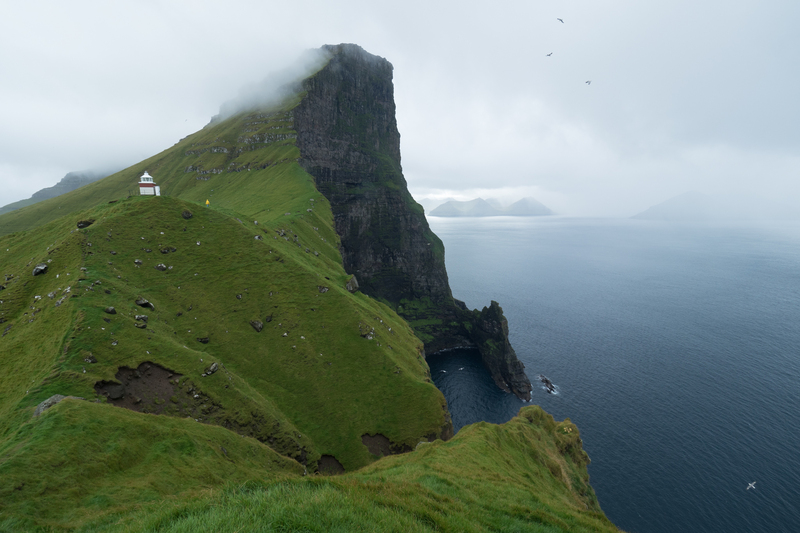 This photography was captured on a story day on the island of Kalsoy on the Faroe Islands. I’m standing on the very far north end of the islands looking back towards the lighthouse. What you don’t see are the dangerously steep slopes and drops all around me. One wrong step and I’m gone for good! Minutes after capturing this image the wind and rain went crazy and the mountain in front of me disappeared in mist and clouds and we had to seek shelter inside the lighthouse. Which, to our luck, was open! And so we waited out the storm with a cup of tea shared by 2 other hikers who had done the 45min walk from the nearest village. Inside the lighthouse we found a logbook which had a few pages of logs dating back to 1962 – the year the lighthouse had been built. We added our names and shortly after left. Quite a few of you have asked me to create video on how I edit my landscape photos. So here it is. I had to do it a few times as the video turned out to be over 20min long and I wanted it to be short and informative. So after the 3rd time around I managed to compress all the vital information into a 9minute video. Perfect! Obviously not every image is edited exactly the same and each image needs different adjustments. But in general this is my process. I’ll usually create presets to apply them to series of images to retain a style during the entire project and make the images ‘belong together’ as I very often create more than one image per job. Usually my presets are a little less aggressive and really just help me save a little time per image by saving the steps I do for each individual image anyway. This will help me get a consistent colour palette and feel for i.e. the Faroe Islands. From those jobs and image series I then go ahead and create a whole package of presets and offer them as preset packs for you guys to apply to your images. Those presets have been optimised to be a little less ‘aggressive’ and give you the creative freedom on top of the preset to modify the photo with you own edit. By buying one (or more) of my preset packs you are supporting my work and helping produce video like the one above and many others on my YouTube Channel. So THANK YOU for considering it and of course for your support!